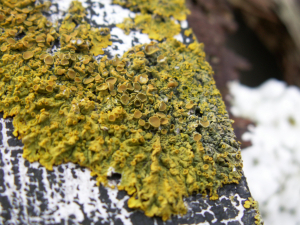 Observation - Yellow/green lichen - UK and Ireland. Description: Very bright yellow edges, but rest is greeny-yellow with some grey lichen. Found on wooden post. Very bright yellow edges, but rest is greeny-yellow with some grey lichen.